The Honda Africa Twin is a dual-sport motorcycle made by Honda in three versions, 1988 to 1989 as the 650 cc (40 cu in) V-twin XRV650, then from 1990 to 2003 as the 750 cc (46 cu in) V-twin XRV750T, and then from 2016 to present as the 1,000 cc (61 cu in) parallel-twin CRF1000L. The XRV750 Africa Twin was a 742 cc (45.3 cu in) dual-sport based on the Honda NXR-750, which won the Paris-Dakar rally four times in the late 1980s. 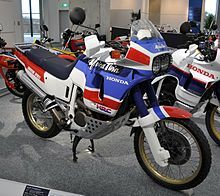 It was preceded by XRV650 Africa Twin, which was a lighter, higher specification version made in 1988 and 1989 by Honda Racing Corporation with a 650 cc engine producing 50 hp (37 kW). The much earlier Honda XLV750R was a shaft driven motorcycle. The engine is a 742 cc, 6-valve, four spark plug, liquid-cooled V-twin. The long-travel suspension insulates the rider from uneven surfaces. The brakes are twin discs at the front and single disc at the rear. The later XRV's instruments feature a large trip computer LCD display mounted above the conventional speedometer and tachometer, styled like Dakar racers' navigational displays, and incorporates a range of extra electronic timers and trip meters. Wheels Front 21-inch spoke, aluminium rim 1.85x21"
Rear 17-inch spoke, aluminium rim 2.75x17" and 3.00x17"
Africa Twin at the 2016 Auto China. The CRF1000L is a 998 cc (60.9 cu in) 270° crank, parallel-twin dual-sport that revived the Africa Twin name for the 2016 model year. It became available in the UK in late 2015 and early 2016 in the US. It was developed as a modern interpretation of its predecessors, the XRV 750 and XRV 650, based on the NXR-750 which won the Paris-Dakar rally four times in the late 1980s. The original V-twin Africa Twin was first sold in Europe from 1988 to the final production year of 2003 but was never brought to the United States. The CRF1000L has also been seen as a response by Honda to the heavier on road focused adventure touring motorcycles such as the BMW R1200GS, Ducati Multistrada, and Triumph Tiger Explorer with a lighter more off-road focused machine. 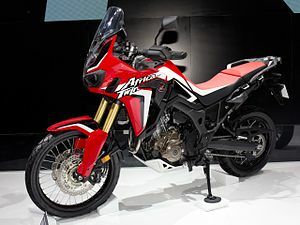 In a first for the category, the Africa Twin has the option of an evolution of Honda's automatic dual-clutch transmission (DCT) technology, which remains unique to Honda in motorcycling. This latest evolution of DCT has been specifically developed and programmed to provide off-road ability. The first confirmations of a new off-road focused touring motorcycle came in June 2014 when Honda filed a patent for an externally mounted airbox configuration which would allow for a more slender and lower mounted fuel tank in future dual sport motorcycles. This increases off-road handling by allowing riders to slide further forward into turns without being inhibited by a wide fuel tank with a higher center of gravity. The first full prototype of the CRF1000 was revealed at the 2014 EICMA international motorcycle show in Milan, Italy. The prototype was heavily disguised with camouflage and covered in mud so that it did not reveal any specific details about the new motorcycle other than visual details such as a parallel twin engine, dual front disk brakes with ABS, 21 inch front and 18 inch rear tires on spoked wire rims, and the absence of a shift lever, indicating the dual-clutch transmission from other Honda motorcycles such as the VFR1200X and NC700X/NC750X could be an available option. After the EICMA reveal, Honda began releasing a series of videos titled "True Adventure" documenting the history of the Paris-Dakar rally-winning Africa Twins in the 1980s in anticipation of the release of the new true adventure. Some performance tests listed here were conducted by Otomotif tabloid from Indonesia in February 2017. ^ a b Koch, Werner (February 21, 2013). 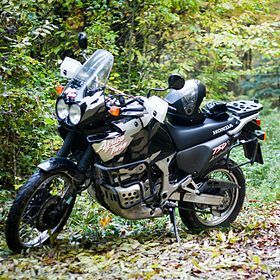 "Auf Achse: Honda XRV 650 Africa Twin". Motorrad Classic. Retrieved March 9, 2017. ^ a b Suesse, Ned (December 18, 2015). "2016 Honda Africa Twin – FIRST RIDE REVIEW". Cycle World. Retrieved March 21, 2016. ^ a b Henning, Ari (December 15, 2015). "First Ride: 2016 Honda CRF1000L Africa Twin". Motorcyclist. Retrieved March 22, 2016. ^ GridOto.com. "Test Ride Honda CRF1000L Africa Twin DCT, Main Tanah Tanpa Gigi Asyik Juga! - Semua Halaman - GridOto.com". gridoto.com. Wikimedia Commons has media related to Honda Africa Twin. This page was last edited on 12 September 2018, at 16:32 (UTC).